For SHIROU, it was the third fight game after joining Petkiatpetch gym. Shirou has won a high evaluation with the first and second game, was told by the president of Jim that he would win the game in the next game and then let the game play on a bigger stage. However, his against fighter suddenly changed. Finally the opponent was decided Thursday. Kaensak Sakrangshit is nearly 180 cm tall. Even though the weight at the time of weighing is the same, some players increase their weight rapidly after weighing. he is a good athlete who is good at suffocating after using his tall. Still, Shiro was advantageous for the multiplication rate before the game from the contents of the game so far. 15:00pm(Thai time) game start. The game started from Shiro’s left light low-kick attack on 1R. Shiro tries to attack with a low kick that is good at it, but do not put it inside as you think with front kick making use of the tall body of Kaensak. The 1 R ended with the development of the eyes of each other. In the second round from the second, the direction to positively go out and attack to give damage to Kaensak . 2R Follow the instructions of the second slow kick and punch forward. 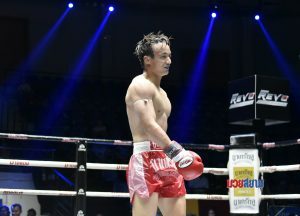 Low kick seemed to be exploding to the opponent’s left thigh definitely, but according to Shiro after the game said that it was shallow to enter low kick. Shiro ‘s favorite attack began, and low kick and punch were decided for Kaensak, there were several scenes that were wobbly, and the gamblers in the hall caught fire as Shiro might KO in the next round. I was attacking to a good point, but here it is gong. Shiro surely took 2R. If 2R’s low kick is on, 3R can advantageously carry out game development. 3R. Kaensak has changed. When Shiro tried to release a low kick, Kaensak forward and reduced the power of low kick, Shirou tried to punch a little bit, Kaensak got through it quickly and got a good head-to-head wrestler. In this round, scenes where the balance was broken by front kicking came out. Shiro who was unable to seize Kaensak ‘s good head – to – head wrestler lost great points in the 3 rd Kaensak. 30 March 2017 Lumpinee Boxing Stadium Shirou VS Daocherndoi Sitnayokpidej.